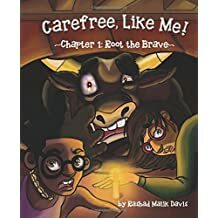 In 2017, writer/illustrator Rashad Malik Davis published Chapter 1: Root the Brave, the first installment in his fun and suspenseful book series Carefree, Like Me!. Davis envisions creating a total of seven “chapters” released at the pace of about one a year. Two are currently available. Chapter One: Root the Brave centers the friendship of two nine-year old children: Amir and Neena. Amir is a super skinny brown-skinned boy with subtle glasses and amazing hair. Neena’s tan-skin has a rosy glow and her shaggy brown hair hangs over her face framing bold glasses. The two children obviously share a strong bond, even though they’ve grown bored with all their old games. It’s this boredom that prompts Amir to complain to his dad who gives him a very special necklace. The necklace transports Neena and Amir into another world. In this realm they are heroes tasked with saving King Root from the monsters under his bed. They are successful and the first chapter of their adventure ends. But as this adventure closes, they are sucked into another land! Stay tuned for Chapter Two: Sacra the Joyous available for pre-order now! Davis is a very talented writer and illustrator. He brilliantly captures his characters colorful emotions and caring relationships in his images. The story is written in clever rhymes that are fun to read out loud and will surely entertain young readers. The pace is perfect for building suspense, but the story isn’t too scary for its target audience of 6 – 10 year olds. I highly recommend this book. I am a sucker for girl-boy besties and really appreciate the cultural diversity in this series! Davis won the 2017 Best Indie Book Award in the Children’s Category for this amazing debut. You can purchase Davis’s books and prints directly from him at his website.